Heeft u een vraag voor Green Park Resort Chitwan? Gunstig gelegen in Chitwan, is Green Park Resort Chitwan een goede uitvalsbasis om deze levendige stad te ontdekken. Het hotel ligt niet ver van het stadscentrum: de afstand is ongeveer 19 Km en het duurt, over het algemeen, ongeveer 40 minuten om het vliegveld te bereiken. Dankzij de praktische ligging, biedt de accommodatie eenvoudig toegang tot alle belangrijke trekpleisters van de stad. Profiteer van de ongeëvenaarde services en voorzieningen bij deze accommodatie in Chitwan. Voorzieningen zoals gratis wi-fi in alle kamers, 24-uur beveiliging, dagelijkse schoonmaak, openhaard, cadeau-/souvenirwinkel zijn direct beschikbaar voor het gemak van iedere gast. Alle gastenkamers beschikken over een variëteit aan voorzieningen. Vele kamers beschikken zelfs over plasma tv, kledingrek, oploskoffie, gratis welkomstdrankje, spiegel, zodat zelfs de meest veeleisende gast tevredengesteld zal zijn. De kano, zwembad (buiten), zwembad (voor kinderen), tuin van de accommodatie bieden alle gelegenheid om na een drukke dag te ontspannen. 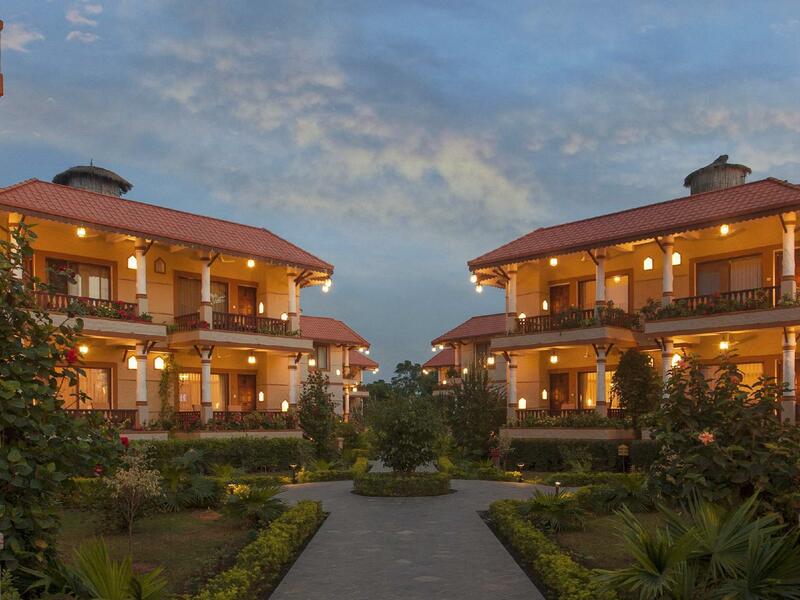 Green Park Resort Chitwan is een ideale verblijfsplaats voor reizigers die charme, comfort en gemak in Chitwan zoeken. Really nice hotel The style of the buildings is a mix of traditional and new. Very comfortable beds, super clean and good food in the restaurant Quiet at night which is rare in Nepal but ask for top floor room if you are a light sleeper as you can hear lots of movement from above if you are downstairs. We had excellent stay. Room are clean, spacious and comfortable. The restaurant is good. Staff are exceptional (except the guide), which i would say the best part of this hotel. The only limitation would be although its under resort category, there is nothing much to do in hotel. It only have a outside lawn but no other activity inside hotel / resort. After arriving at Green Park Resort after a long bus trip from Kathmandu we were both amazed. Firstly the reception area was open and a welcoming setting and the staff greet you with smiles and friendly greetings. The room was one of the best rooms I have stayed in a very long time, better than most resort rooms back in Australia. It had a balcony, large open shower and separate toilet. The bed was comfortable and room was warm (winter) I cannot write a negative comment on the room. The restaurant is towards the reception at the front of the hotel and once again the staff there are extremely welcoming and always a smile on their face. We ate at the restaurant several times and was always of a high standard. The tour prices that they offered at the hotel were not much more expensive than on the streets and they offered transport to and from which many other places would not. I cannot write anything negative about Green Park Resort however it is located a couple of Kilometres from the main area/River. This was not an issue as reception would organise a taxi or let you ride there bikes (free) into town. I would stay here again and intend on staying here again next time I manage to come to Chitwan, Nepal. Special thanks to Kiran & Babu for making our stay comfortable! The room was spacious and the food was awesome! Ambience is very nice. I would definitely recommend this hotel to both family and business travellers. The hotel so amazing. The staff is very helpful and courteous. The only drawback is their food quality and taste. Their breakfast is very poor, they serve the leftovers on the next days breakfast. I loved the hotel but I preferred eating outside. Stay here but don't eat here. I like there, if need to say something not good enough. My friend and me stay here 3 nights, so we felt foods almost same everyday. hope we will have more choice in the future. Small but overall clean and well kept property. Good service from staff. The food choices were very limited . Pushing guests to go for buffet and relutance to serve to order. The buffet also had very limited choices and quality of the food needs attention. Chandra, from United Jungle Guide Services, recommended Green Park, as it is by the river. This means that if you use United Jungle Guide Services, as I recommend that you do, for a guided trip, you can see the 2 types of alligator and much water birdlife. You may also see other wildlife on the walk back. We only stayed at Green Park for 1 night, but it was great. We enjoyed the food and the staff were helpful. It was also quiet. The one complaint would be the mattress- not very comfortable, but not terrible for Nepalese standards either. My wife and I absolutely loved our stay here. We made the (questionable) decision to walk to the hotel from the tourist bus park, so we were pretty sweaty by the time we arrived, but we were immediately greeted with cool towels, cold juice, and a comfortable seat under a fan in their beautiful lobby. We had just came from Kathmandu/Bhaktapur, and we breathed a heavy sigh of relief when we arrived at this lovely, tranquil hotel. Everybody there took such great care of us from check-in to check-out. The food was delicious, the cultural dance performance was awesome, and the staff were so helpful with booking our activities (e.g., elephant ride, jeep safari). The honeymoon suite was quite sweet indeed! Had an amazing time at Green Park the organised tours were brilliant. It was disappointing they still offer elephant rides considering the poor ethics of this activity but the bike ride, river and jeep safari were all amazing. The hotel is right by traditional local communities which are lovely to see. The food at the hotel was really tasty, the rooms are lovely, pool was spotless. Would stay again. It is definetely worth the money, good facilities, the Roms are very nice and the Pool is great! The hotel jeep takes you to the city whenever it is possible and the staff is very friendly. We where there during a big Festival and because of that a la carte was Not possible the whole day! The activities are nice but think about the moral aspects of elephant tourism. Even the Little elephant calves are chained in the elephant breeding centre! it was a very nice Trip and I would highly recommend this Hotel! We loved the pool, the staff - who kindly, and successfully, hassled Buddha Air to actually fly our luggage from Kathmandu and bring it to us! Activities are pricey but enjoyable. The buffet was very good. Lovely walks to the village and the river. Well appointed rooms with tea and coffee. Very good a/c and fans ( it's hot here in September) with a reliable electricity supply. Fabulous place for birds; knowledgeable guides are around ( thanks Robbie!). Fantastic hotel so clean comfy beds. Staff are amazing and the food was delicious. So helpful with organising our activities. This was pure luxury for us after traveling around Nepal. Only 1 star missing on facilities as had to go to hotel lobby to get wifi . But I really recommend this place, a gem! this hotel is great. excellent rooms, very clean, great staff, good food in their restaurant. alas not perfect...it is extremely isolated. no shops or restaurants within walking distance. very hard to charter rides in chitwan. expensive in this hotel. After 9 days travelling around Nepal, staying here was luxury! When we arrived the staff welcomed us with cold towels and fresh juice which was just what we needed. The beauty of the hotel is unbelievable- you would never think a hotel like this exists in Chitwan. The colours of the flowers and the layout is perfect! 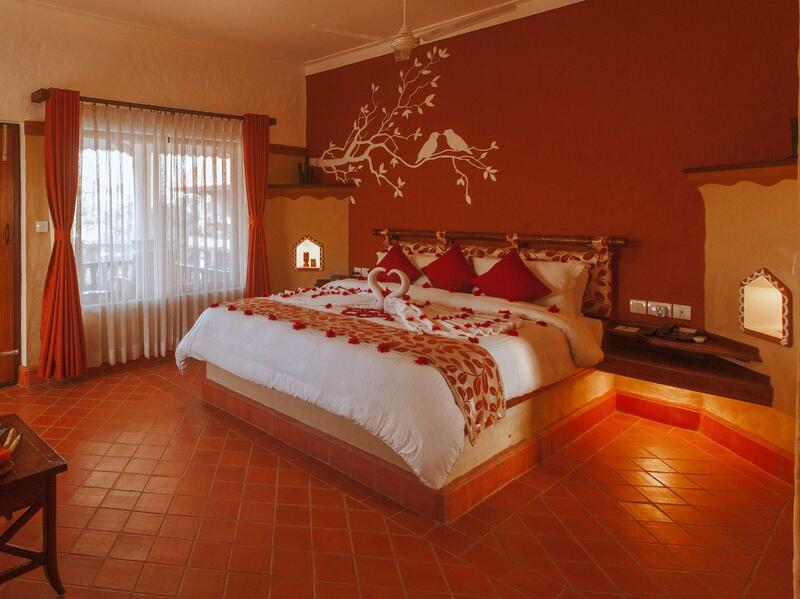 The rooms are lovely, with a fan on the balcony it means you can sit outside and not be overwhelmed by the heat. Inside the room was also stunning, the air con was quiet so we had a great sleep! We were lucky enough to watch a cultural show in the gardens whilst sat at the bamboo bar. the only con about this hotel is that it's about a 25 minute walk from the main high street (which isn't really a con because you get to see the beauty of Chitwan and walk past little villages! ), but on a hot day it does take it out of you. My partner and I decided to rent out some bikes as we had to kill a couple of hours before we got picked up at 6pm and the hotel were more than happy to look after our bags. Overall I would recommend this hotel to everyone! The staff are so friendly (they even went to the high street for me and got sun cream!) and the hotel is spotless. Our great experience of Green Park began as soon as we arrived at the bus terminus, where the resort had sent a jeep to collect us. The welcome was most courteous and friendly. 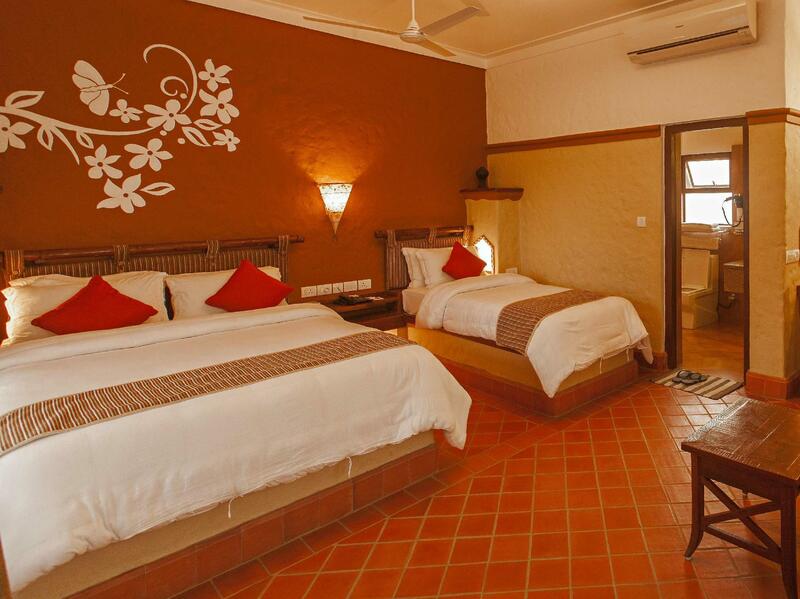 The accommodation was exceptional with a very modern and well-appointed bathroom with rainfall shower. The balcony was lovely, and afforded many sightings of insects and reptiles after dark! The pool was immaculate and scrupulously clean. The hotel staff arranged all of our excursions and in a very straightforward way. We took the elephant and jeep safaris, seeing four rhinos up close, together with three varieties of deer, wild boar and monkeys among other species. The only word of warning is that the western food in the restaurant isn't particularly good quality and the service is quite slow. I would recommend sticking to the local dishes on the menu that were delicious. Design of this holiday resort is exceptional - so well laid out with beautiful gardens, pool, plenty of seating in the gardens, very well appointed accommodation. Particularly lovely are the illuminated niches dotted throughout the development - at night it looks like fairyland! Staff are very friendly and helpful. Particular mention must go to Bimita, our safari and bird watching guide. We highly recommend Greenpark. We were mother and daughter (25), traveling together for two weeks. In Chitwan we spent five days, paidforthree excursions and went bicycling on our own ft worth days in a row. Our stay at Green Park was comfortable, relaxing and interesting as we were able to see a number of exotic animals. We will highly recommend the hotel and Sauraha/Chitwan.